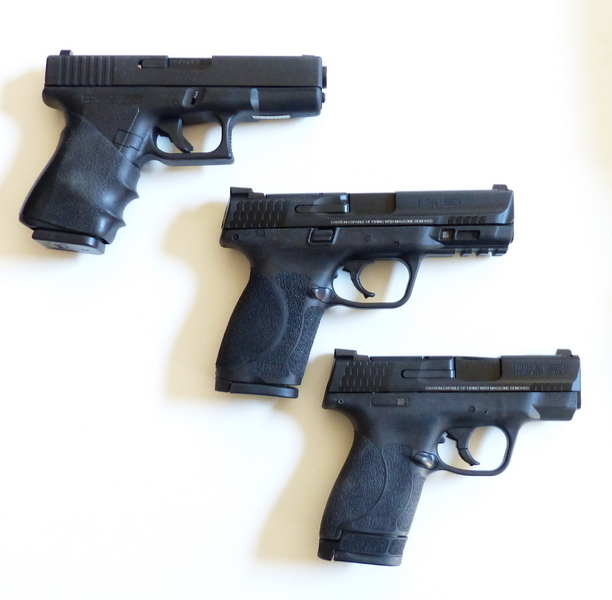 Left to right: vintage Glock 19, S & W M&P M2.0, S & W M&P9 Shield M2.0. All have factory tritium night sights. The previously tested full size M&P M2.0 has the following specifications. This compact version has the following factory specifications. The differences in envelope dimensions are not huge: yet the new S&W M&P9 Compact takes the MP9 into the Glock 19 category, with 15 round magazines as opposed to the 17 round magazines of the full-size M&P9 and the Glock 17. For many, many years, I've used a Glock 19. This is the first pistol that eliminates my old, trusty Glock from my working inventory. The grip, grip texture, improved trigger, soft-shooting, and general handling all combine to soundly beat the Glock, as far as I'm concerned. It is always a good move to go to your local Pro Shop, rent the pistol you have the most interest in, and poke holes in some paper. That will tell you more about how much you enjoy shooting a particular handgun, or indeed not. Most folks will end up buying the M&P 9 M2.0 with no hesitation after a test drive. By comparison, the Glock 19 feels thick, boxy, and slippery. The finger rests integral to the Glock grip are an acquired taste, one that many have never fully acquired (finally done away with in the G19 Gen5). 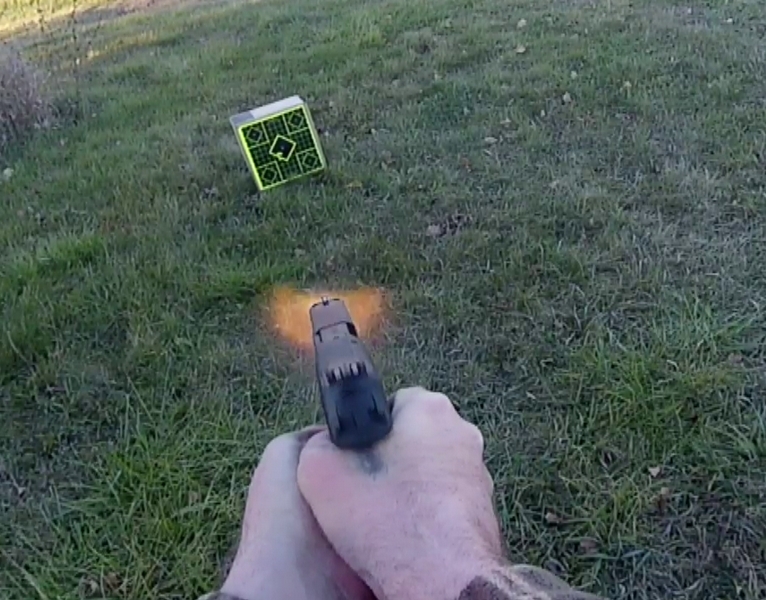 Where the Glock 19 magazines dribble out, the M&P 9 M2.0 magazines eject. With the four supplied backstraps, all having the new grippy texture, the S & W will fit far more hands, far more comfortably. Not only is the S & W M&P9 M2.0 the better handgun, it runs a hundred dollars or so less than the Glock. The Smith & Wesson M&P 9 M2.0 Compact is just about as close to the ideal handgun for general use, as far as I'm concerned. It is ideal for the nightstand or car, and as far as concealed carry, many have no problem wearing them, but the Shield platform is more my speed, in terms of envelope dimensions. In terms of improvements of practical value with this model, they are numerous. The trigger and the drip have already been cited: with the four included palmswell grip inserts, this pistol is more likely to fit you. The rigid extended, embedded stainless steel chassis is a rigidity improvement in this model, just as it is in the full-sized M&P 9 M2.0. What S&W calls "Armonite" is their branding of ferritic nitrocarburizing along the lines of Tenifer and Tuffride. This envelope size of pistol is sometimes referred to as the "crossover" style, suitable for carry and for home defense. For many, it is only handgun you'll ever need. Smith & Wesson has vastly upped their game, primarily due to the grip texture and improved triggers. For the first time, with the M2.0 Compact, S & W perfection beats Glock perfection, and that's really saying something. This is an outstanding effort by Smith & Wesson.